Options - Wooden It Be Nice!, Inc.
Wood is generally categorized into two groups: hardwood and softwood. Hardwood comes from deciduous trees, which have broad leaves that shed during a certain season of the year. Softwood comes from coniferous, or cone-bearing, trees with narrow leaves or needles that remain on the tree year-round. Most quality furniture uses hardwood in either solid or veneer form as a primary wood; a softwood is used as a secondary wood for the inside of cabinets, drawer sides, backs or bottoms. Mahogany. 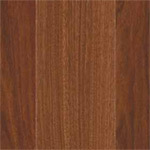 Mahogany is a strong, relatively hard wood that works and finishes well. It is also used for decorative woodwork and was widely used in shipbuilding. Mahogany falls into three basic categories: American mahogany, African mahogany and Honduran mahogany. In mahogany's natural state the open-grain wood has a light pink to reddish brown color with a fine texture. In addition to straight grain, mahogany can have interesting patterns, including the crotch grain pattern often used a veneer face for cabinet doors and drawers. You can find mahogany finished in various tones of red, and beautiful brown and golden tones. [$$ - increases price by approximately 35%] Maple. 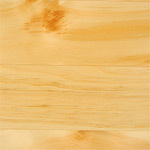 Maple is an exceptionally hard, dense, close-grained wood. In its natural state the wood has a white or off-white to amber color. The grain is tight and subtle, except in the case of burl, curly, fiddleback, and bird's-eye maple. These grain patterns offer a variety of interesting, beautiful configurations and are often used for decorative purposes. Because it's so dense, maple is heavier than most other hardwoods. Oak. Common varieties of oak used in furniture include white oak, red oak, and English, or brown, oak. Oak has a pronounced open grain with a rough texture. It is quite hard, sometimes making it difficult to work. 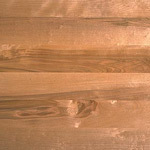 White oak has a slightly gray-brown color. Red oak is similar except that it has a reddish brown tinge. English oak tends to be a deeper brown color. Poplar. Another hardwood, poplar has a straight, even, closed grain, but it is fairly soft, making it easy to work. Poplar is white or yellow, sometimes with a green caste and an occasional dark streak running through it. It is widely used as a secondary wood for the insides of cabinets, chests and drawers. Rosewood. 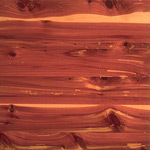 Rosewood is a distinctive-looking hardwood. The wood is naturally brown or reddish brown with dark or ebony grain figuring, but it can sometimes have a creamy color in it. Because of its hardness and density, rosewood can easily be finished to a high luster. Rosewood is resistant to shrinking and is often used in musical instruments like pianos or guitars. Teak. This naturally oily wood is a yellowish brown open-grain hardwood that is popular for both interior and exterior woodwork, especially on boats. Teak will usually have a rubbed oil finish when found in furniture. Pine. Pine may appear to have either a white cream to tan color or a yellow color with a brown grain figure. You'll also see knotty pine, known for prominent and abundant knots in its boards. Pine has a tendency to accept liquid wood stain unevenly and may produce a blotchy appearance. Cedar. Because it has an aroma that is disagreeable to insects such as moths, cedar is commonly used to line chests and closets used for garment storage. Cedar is a pink-to-brown close-grained wood used for exterior as well as interior woodwork, owing to its resistance to decay.